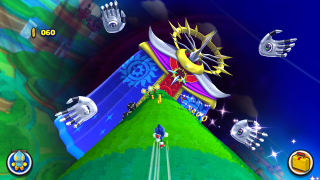 Nightmare Zone is a DLC level in Sonic Lost World, and is themed on fellow series NiGHTS into Dreams. It was included as a bonus in all first-run copies (called the "Deadly Six Bonus Edition") and first-week downloads of the Wii U version. The download code included with the US version expired on October 22, 2014. The PC version of the game has the Zone included for free in all downloads. Zazz's Moon Mech is replaced with Puffy. Zomom's totem block is replaced with one of Wizeman's hands. Master Zik's fruit is replaced with Gulpo. Zeena's snowmen are replaced with Clawz and his mouse fireworks, and is fought without the snowball gimmick. Zor's owl mech is replaced with Jackle. Zavok's dragon mech is replaced with Gillwing. Inbetween Master Zik and Zeena's fights is another "mach speed" section with more Blue Chips and yellow rings. Eventually, NiGHTS will appear and trap Reala in a paraloop, saving Sonic from Wizeman's curse. The rest of the Zone is one last "mach speed" section where Sonic runs with NiGHTS and flies through clusters of yellow rings, giving him up to 700 rings, before releasing Nightopians from a Nights Capture at the end, which count as Animals. Like all DLC levels, once Nightmare Zone is completed, it will disappear from the World Map. It will reappear after the player scores another 100,000 points. When Nightmare Zone is selected, Sonic lays down and goes to sleep, indicating the zone is nothing more than a dream like the NiGHTS games are. Ironically, Reala is not fought as a boss despite being featured as a boss in all NiGHTS games. Super Sonic cannot be used in this level. This page was last edited on 8 April 2018, at 07:57.